Military historians have assumed that the French lost the first battles of World War I because they launched suicidal bayonet charges against German machine guns. Therefore, for nearly a century, these battles have been considered uninteresting. In reality, these were some of the most important, hard-fought and instructive battles in modern military history. The Battle of the Frontiers, Ardennes 1914 is the first description and analysis of this battle at the tactical level, based on groundbreaking research conducted at French and German army archives. It also makes use of neglected French and German books and articles as well as German regimental histories, and includes personal accounts by participants such as Manfred von Richthofen (when he was still a cavalry lieutenant) and the young Erwin Rommel. The Battle of the Ardennes, 1914 presents a dramatically new perspective on combat in 1914. The Battle of the Frontiers, Ardennes 1914 gives the first clear and complete picture one of the most tactically interesting battles of the Great War, maneuver battles having nothing in common with the later trench warfare slaughters. The Battle of the Frontiers, Ardennes 1914 begins with a description of pre-war German tactics and training, methods so modern that they are still used in all effective armies today. The book next discusses the German and French intelligence estimates and war plans that were the background for these battles. The lion’s share of the book is devoted to combat and tactics at the individual, platoon and company levels, based on personal accounts, after-action reports and unit histories, supported by numerous maps. 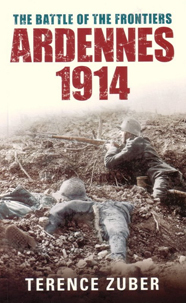 The Battle of the Frontiers, Ardennes 1914 (Tempus, 2007) 314 pages, 22 illustrations, 20 maps.